On March 21-22, the members of OPA Europe met at Der Spiegel in Hamburg to discuss Innovations in Advertising. Presentations examined programmatic trading strategies, content marketing / native advertising services, viewability, ad fraud, brand safety, ad blocking, policies for mobile and video, as well as B2B revenue streams that are resulting through content development. 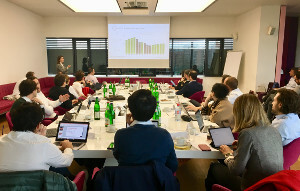 Our sponsor, Outbrain, presented their discovery platform that helps connect publishers to their target audience through personalized recommendations. Attending companies included: Frankfurter Allgemeine Zeitung, The New York Times, Le Monde, La Repubblica, El Pais, The Telegraph, JP / Politikens, IQ Digital Media, Le Figaro, Spiegel Media, Ringier Axel Springer, Henneo, Gruppo 24 Ore, Cofina Media, Tamedia, Vocento, Grupo Godo, Süddeutsche Zeitung, GEDI Gruppo Editoriale, and Digital Content Next. 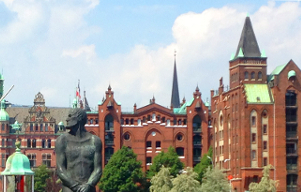 OPA Europe's upcoming Best Practices meeting will take place on March 21-22 in Hamburg, Germany. Its central topic is "Innovations in Advertising". Discussions will focus on two key pillars: (a) Programmatic and (b) Branded Content services to clients. There will be an extra focus on the Mobile and Video dimension, as well as new ways brands are monetising content. Participating companies include Le Monde, The New York Times, Der Spiegel, The Telegraph, Le Figaro, Grupo Godo, Ringier Axel Springer, JP/Politiken, GEDI Gruppo Editoriale, Prisa, Handelsblatt Group, Tamedia, Unidad Editorial, Vocento, Frankfurter Allgemeine Zeitung, Les Echos, Henneo, Suddeutsche Zeitung, Gruppo 24 Ore, Cofina Media, and Digital Content Next. 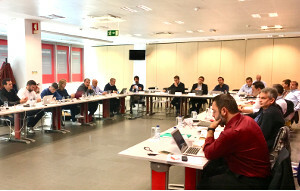 On October 18-19, the members of OPA Europe met at Cofina Media in Lisbon to discuss Online Digital and Audio Strategies. Presentations examined digital video and audio content produced, effectiveness metrics employed to assess performance, HR and tech tools, marketing and distribution strategies, as well as overall monetization strategies. Our sponsor, Wildmoka, presented their live video editing platform that automatically tailors live content to all digital channels and audiences. Attending companies included: Ringier Axel Springer, Le Monde, Spiegel Online, The Telegraph, Unidad Editorial, JP/Politiken, Le Figaro, GEDI Gruppo Editoriale, Prisa, Henneo, Cofina Media, Grupo Godo, Gruppo 24 Ore, and RCS MediaGroup. 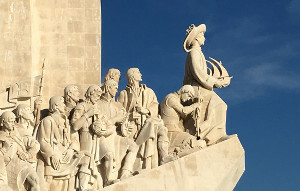 OPA Europe's upcoming Best Practices meeting will take place on October 18-19 in Lisbon, Portugal. Its central topic is "Digital Video and Audio/Voice Strategies". 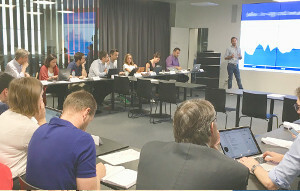 Participating companies include Le Monde, RCS MediaGroup, The New York Times, Spiegel Online, The Telegraph, Le Figaro, Cofina Media, GEDI Gruppo Editoriale, Les Echos, Prisa, and Gruppo 24 Ore.
On June 21-22, the members of OPA Europe met at Ringier Axel Springer in Zurich to discuss Reader Revenue Strategies. Presentations examed major initiatives that premium publishers are undertaking in terms of subscriptions and/or membership schemes. Our sponsor, Marfeel, presented their solutions for optimizing engagement and monetization potential for publishers on mobile devices. Attending companies included: Ringier Axel Springer, Le Figaro, Tamedia, The Telegraph, Unidad Editorial, Le Monde, Aller Media, The Guardian, GEDI Gruppo Editoriale, NHST, Prisa, Henneo, Cofina Media, Grupo Godo, Il Sole 24 Ore, and RCS MediaGroup.